This article originally published in the Naples Daily News. This summer, 24 students from all corners of Collier County saw business from a vantage point above the usual bottom rung on the corporate ladder. It’s a perch that’s given them a much broader business perspective, even if the height occasionally caused vertigo. The teens spent four mornings a week in an inaugural Corporate Development Program learning packaging, human resources, development and more with Taste of Immokalee, a B-corporation that shares a mandate for community good with financial profitability. 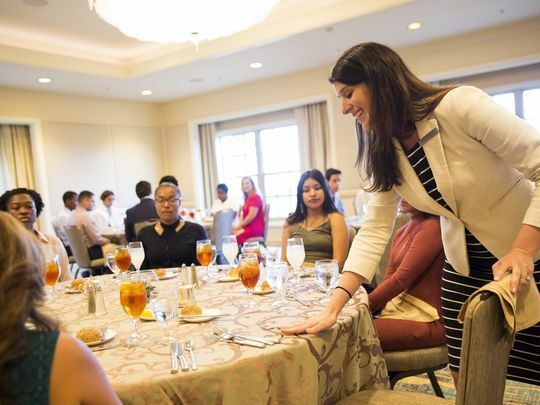 Their final Thursday in the eight-week paid internship with the Taste of Immokalee corporation included a surprise luncheon at the Ritz-Carlton, Naples. Table manners, appropriate attire and body language would be the lessons that day before the group navigated place settings with three forks and spinach mousse-stuffed chicken. Between bites and newly learned requests to pass salt and pepper rather than reaching for it, they mulled over their business world experience. “I’m thinking of mixing up business with computer sciences now, knowing that to make a business successful there are a lot of things you’ve got to go through,” Barron High School senior Omid Ghazizadeh said. “For marketing and branding, you need so much creativity. You always have to have it,” marveled Marco Garza, an Immokalee High school junior. Garza said he was surprised at how often the class had to change gears for different audiences â€” broadcast, print, social media, public relations, even point of purchase marketing, such as where one’s product is displayed in a store. “Most of us had never worked at a business before. We walked in the very first day and realized it’s really organized. We learned what it took to run it,” said Sai Rachumalla, a Naples High School sophomore. That’s exactly what Jon Slusar, president of Taste of Immokalee, had hoped for. They grouped around chef Ralph Feraco at the Kensington Country Club to formulate juice products, an idea to supplement the current salsa and sauces product line for Taste of Immokalee. And they brainstormed advertising in the conference room at the Greater Naples YMCA, a program supporter, and debated distribution avenues at the Immokalee Boys & Girls Club. Students were divided into small groups. Each shared project boxes that moved with them between eastern and western Collier County business “classrooms.” If that seemed a bit of a hardship to keep packing and unpacking, it was an example of Slusar’s “life lessons through business” motto. Many students said learning to approach people was a big lesson. “One of the most important things is to network by introducing yourself,” added Wenchy Dutreuil, a sophomore at Immokalee High School. Dutreuil had taken his newfound knowledge seriously, writing a thank you note to YMCA officials. He learned at the luncheon that it had found its way to Richard Schulze, the Best Buy founder whose family foundation had largely funded the paid summer internships. Bank of America and Banke United also funded grants. “I don’t think this summer was enough,” lamented Amy Lopez, a Baron Collier sophomore. However, the students can apply for a longer internship with Taste of Immokalee. They’re on a group mailing list that will keep the entire group updated on the Corporate Development Program and Taste of Immokalee. School activities and college away from Collier County would deter some students from continuing, but Capita said eight students have asked to keep working in the business. Now Capita is seeking funding to include them all.